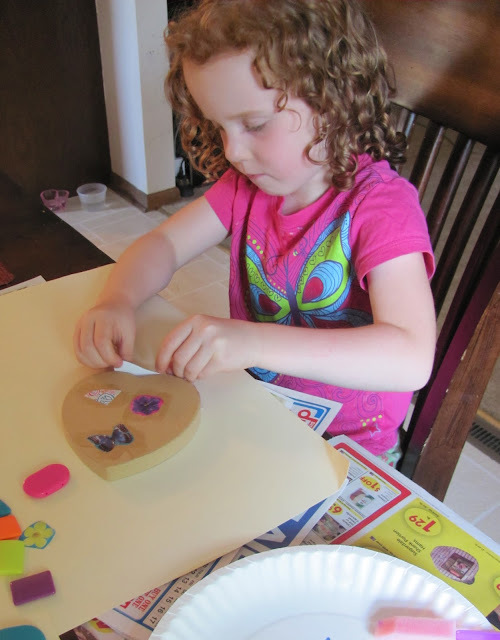 Does your child enjoy making jewelry and decoupage? Craftprojectideas.com is providing me with their Jewelry Decoupage Set to give to one lucky reader. You can buy all of their great Craft supplies and kits at WalMart department stores in the craft section. We received the Jewelry Decoupage Set recently and it was a great activity to create many projects with my daughter. We are also going to use some of the competed projects or gifts. 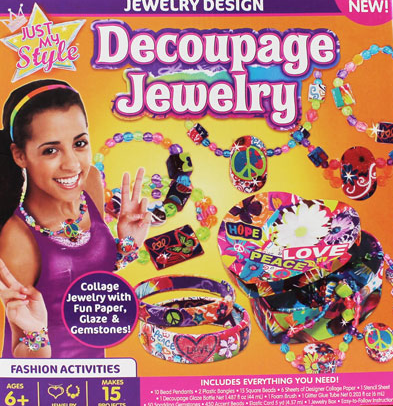 Keep reading to find out how you can win this Decoupage Jewelry Set. Here are all the materials that this kit provided....with a lot left over. My daughter began by decoupaging the cut out papers to the heart box. Using the fun foam brush and decoupage. After decoupaging, stringing beads to create a necklace. It just happened to match her shirt! 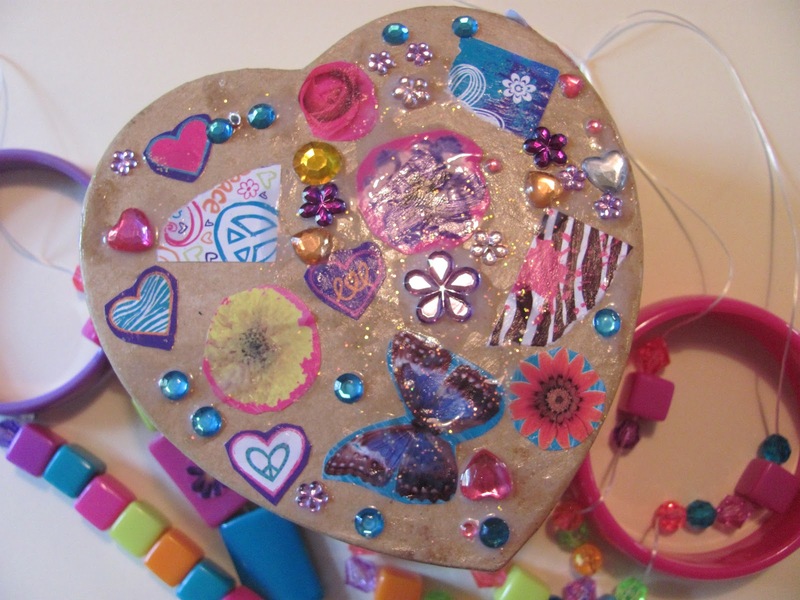 C's finished Decoupage Box and necklaces/jewelry. Go to Craftprojectideas.com and view some of their kits. Let me know what other kits interest you in the comment section. Be sure to check out Craftprojectideas for numerous craft ideas (including Basic Techniques, Material of the Month, Rainy Day Projects, Seasonal Projects, and The Teacher's Corner here. Also, check out their facebook page here. Winner will be selected July 24, 2012, at 10 pm EST. 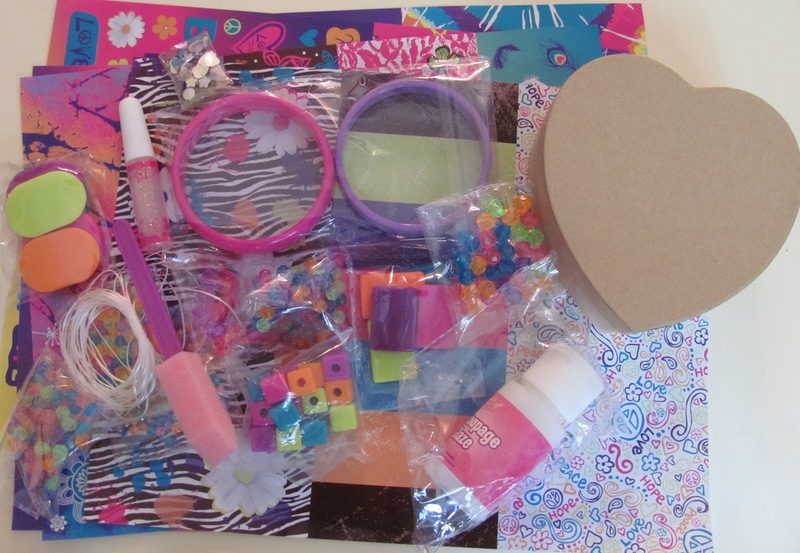 Also, I like the bohemian bracelets kit, so adorable! The create your own messenger bag looks great! Love the 3D Melty Beads! My son would have so much fun with it! Great ideas on their site. I think my little ones should love the box of wooden projects. The Bottle Cap Jewelry Kit is pretty cute, too. Anything jewelry my daughter would love. The bottle cap jewelry is different and neat. My daughter would love the 3D Melty Beads! My daughter would love this! Their 'Ultimate Box of Projects' looks fun!